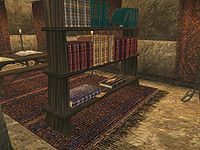 Save a woman's home by robbing the Vivec Library. Talk to Jim Stacey for a new job. Go to the Library of Vivec to steal a forged land deed of sale for Indrele Rathryon's land. Return the deed to Indrele in Seyda Neen. Return to Jim to complete the quest. For the third quest in this series, Jim asks you to stop Velanda Omani from stealing Indrele Rathryon's land via a forged land deed placed in the Library of Vivec. You must steal the deed from the library and return it to Indrele in Seyda Neen. The Library can be found in the Halls of Wisdom in the Temple Canton in the south of Vivec. The deed is half hidden on the bottom shelf in the north end of the library (third shelf from the right while facing north and watch out for the guards). Travel to Seyda Neen (the town where the game starts), find Indrele behind her shack in the west of town and return the deed to her. If you're wearing the gloves of Bal Molagmer she'll seem familiar with them. Return to Jim in Vivec for his congratulations. 10 Gentleman Jim Stacey asked me to find a forged deed of sale for Indrele Rathryon's land. The deed is in the Library of Vivec. I should deliver the deed to Indrele Rathryon herself in Seyda Neen in the name of the Bal Molagmer. 30 I gave the land deed back to Velanda Omani. 50 Indrele Rathryon accepted the false deed to her land. 55 Indrele Rathryon accepted the false deed to her land. She seemed to recognize the Bal Molagmer gloves I was wearing, but could not place from where. 100 Finishes quest Gentleman Jim Stacey thanked me for taking the land deed to Indrele Rathryon. This page was last modified on 12 November 2013, at 01:26.